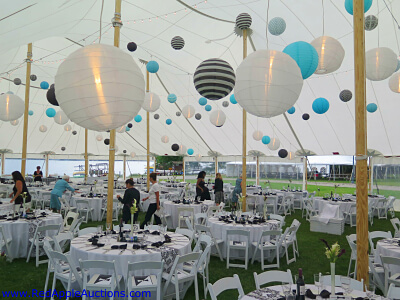 A tent with clear sides served as the auction venue for “The Black & White Bow Tie Gala.” Aqua was the accent color. 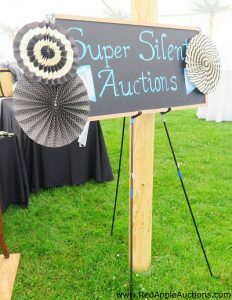 My most recent auction was in upstate New York, working with Adirondack Health Foundation. I’ve worked with this creative development staff for three years, and I’m impressed that they’ve held their fundraising gala in a new location every year. In today’s post I’m going to share a few reasons as to why you might want to consider changing your auction venue. 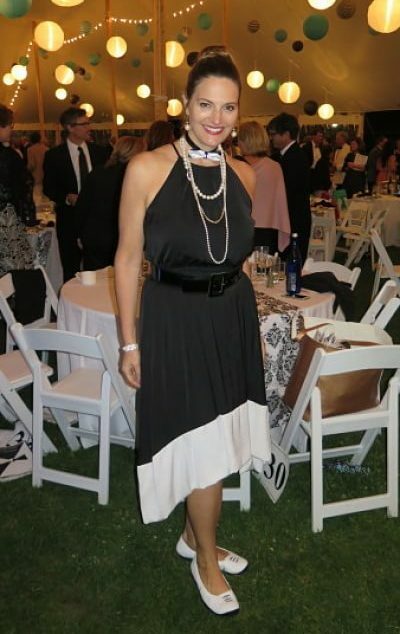 My black and white dress, complete with bow tie. I’ll be honest. Changing venues usually adds stress to your auction preparations. It requires extra planning as a new venue must be evaluated for electrical needs, catering demands, guest flow, table spacing, parking, and countless other details. But here’s a tip: To ease the stress of a venue change, consider selecting a caterer who already has experience working in your chosen space. 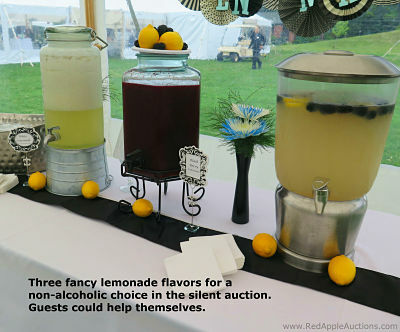 Why opt for a new auction venue? Moving a venue keeps it interesting for guests. They look forward to visiting new places. Several of my clients, including this hospital, provide services to a region that has distinct cities or populations. Moving the venue around to each of these cities ensures no specific group of donors feel slighted. If you want to incorporate mobile bidding, the technical needs of your solution must be met. You might need a venue with a good wireless signal or want more electrical outlets to accommodate charging stations. If your guest count dramatically expands or shrinks, you’ll need to relocate to a right-sized venue for your group. Not too big; not too small. The three color scheme was used for all decor. Sometimes a hotel will break a contract with a nonprofit because a more lucrative booking has materialized. It forces the nonprofit to hunt for a new space. Sometimes a theme influences the venue selection. For instance, a “Summer Solstice” theme would fit nicely in a tent or barn. Another example: A few years ago, a school client selected a jungle theme. They booked a local catering hall that was known for its unusual decor — dozens of big game trophy animals were mounted throughout the hall. Are you honoring someone? Consider the interests of your honoree so the venue is special for them. For instance, you might opt for a golf course venue for a passionate golfer, or a library space for an avid reader. This spring I worked in Amarillo, TX. The venue was the lobby of a local college administrative building. Never before had the lobby been used for an event of any type, but it fit the auction crowd perfectly for a sit-down auction. It would have been a great space for an honoree who was a strong proponent of education. Non-alcoholic drinks were self-serve on a table. Here’s another example, from my featured client today. Three years ago, Adirondack Health Foundation honored a man who was not only known for his contributions to the hospital, but who had also enjoyed many decades as a professional ice dance competitor and judge. The hospital held their auction gala in the Lake Placid Olympic Conference Center so that they could weave his ice skating interests into the program. The entertainment was an ice skating show held in the historic 1932 Olympic rink. Here’s a video from that gala three years ago. Enjoy! Are there other reasons to switch venues? I’m sure there are. Why have you moved to a new auction venue?